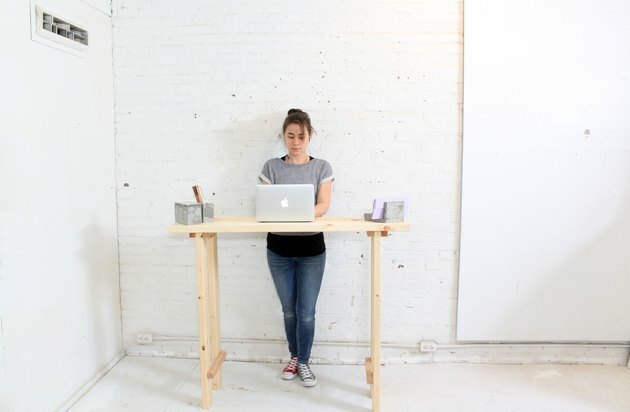 Standing desks are in, no doubt about it. But, would you really use one? Absolutely, if you just give it a chance. 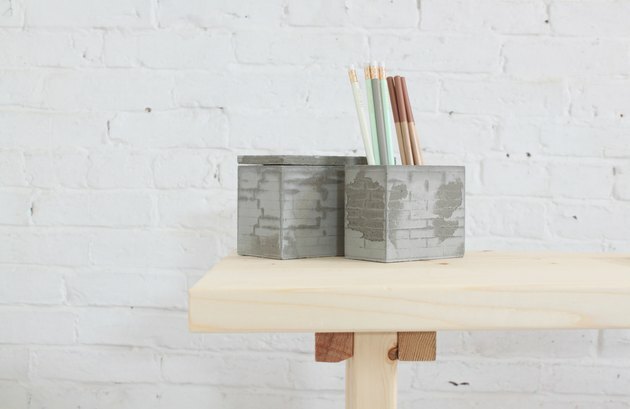 This simple design is an easy way for beginning builders to practice their skills and try out the new(ish) concept. 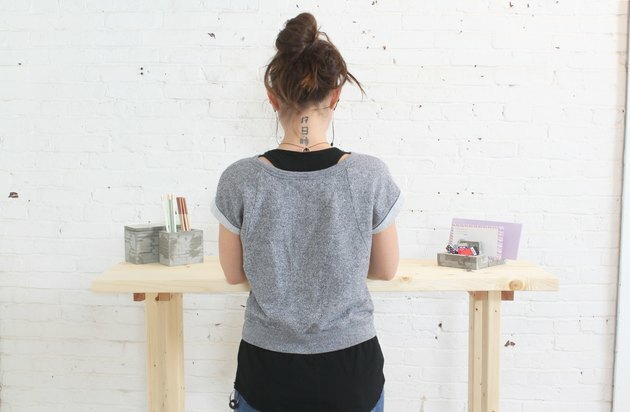 And, hey, if you don't like it as a desk, it could just as easily serve as a bar! 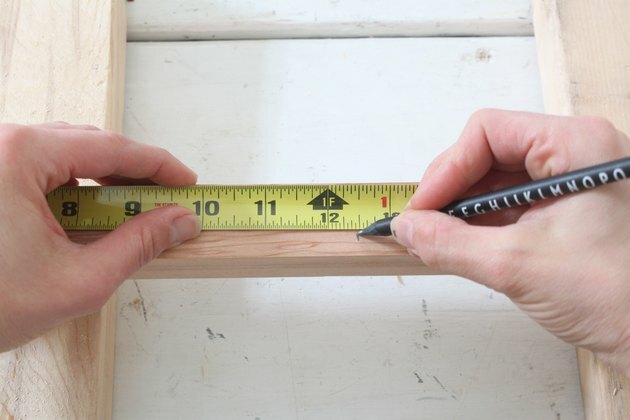 Using a tape measure and a pencil, make a mark at 4 feet on each of the 2 x 6s. 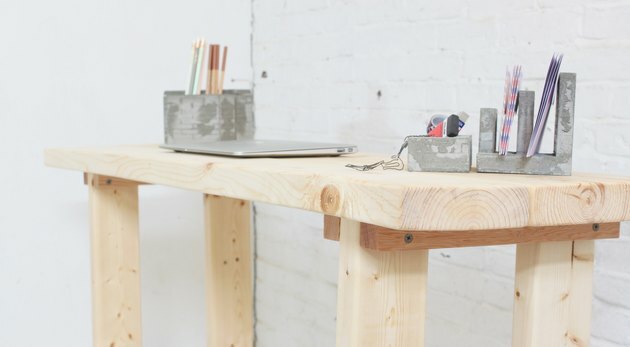 These three boards will form the horizontal top of your desk. 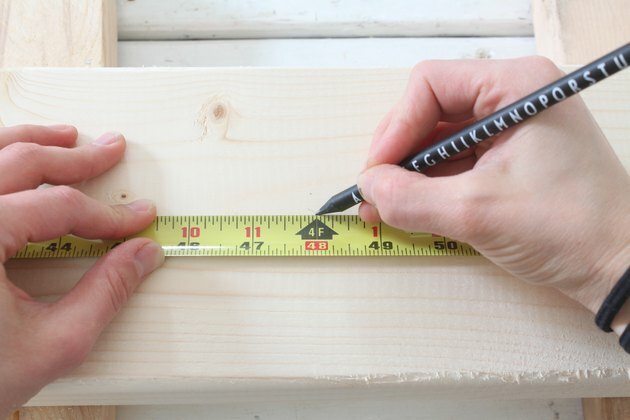 Use a square to draw a straight line at the 4-foot mark, perpendicular to the edge of the board. This will be your cut line that guides your blade. Use a circular saw to cut along that line. 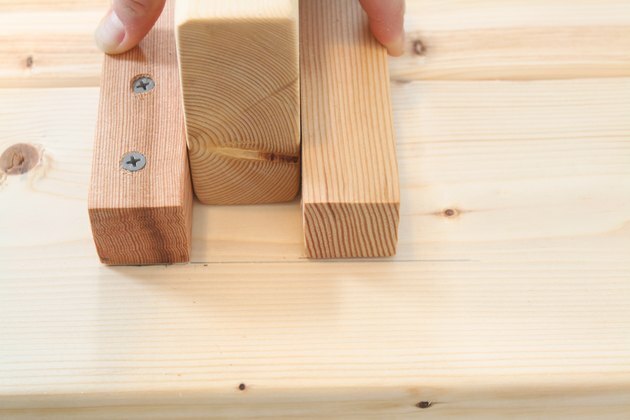 Cut all three 2 x 6s to length, using a circular saw. 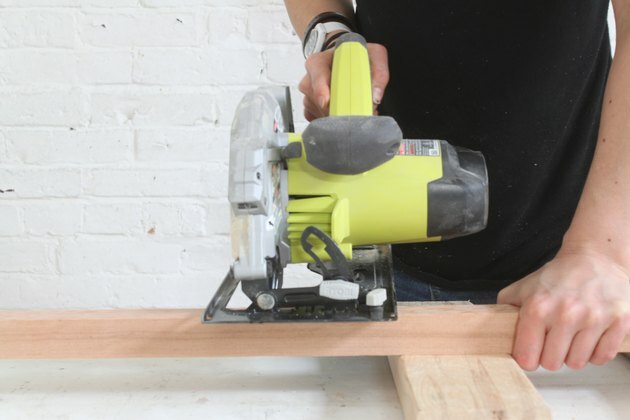 The saw blade should be set at a depth just a bit deeper than the thickness of the boards. 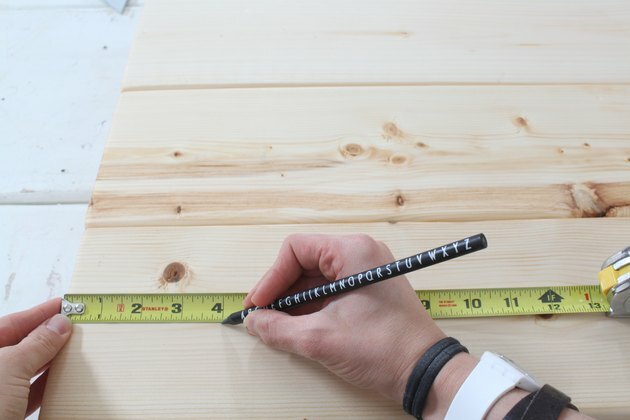 Make a mark at 38 1/2 inches on each 2 x 4 to create the four legs of your desk. 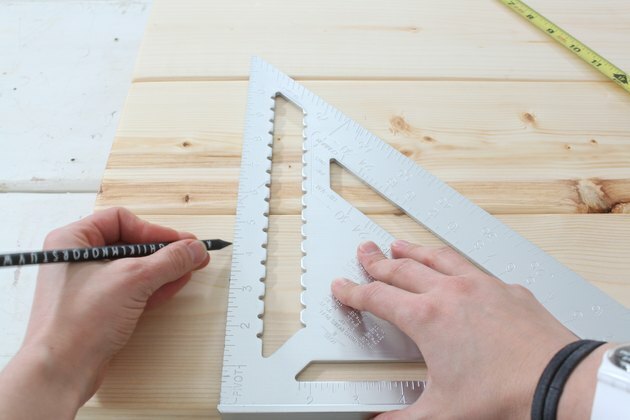 Use a square to draw a cut line at the mark. 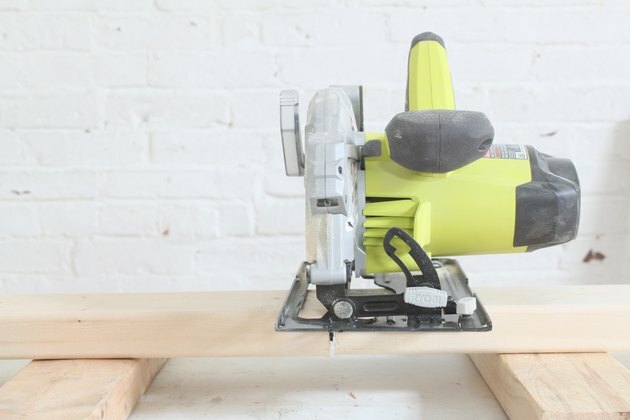 Use a circular saw to cut both 2 x 4s. 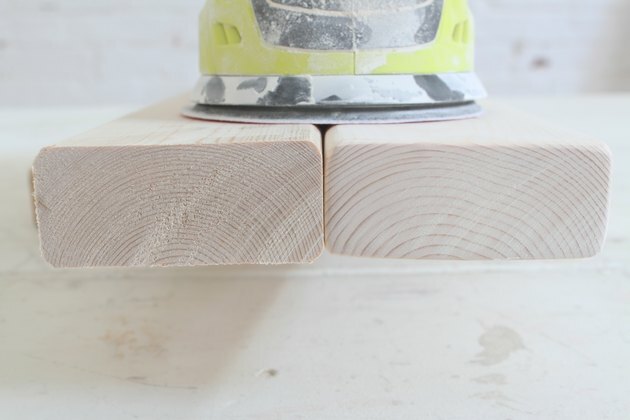 Repeat steps 4 and 5 with the leftover 2 x 4. Mark the balusters at 12 1/2 inches. You will cut a total of six pieces. Four pieces will be used as cleats to hold the legs to the bottom on the desk surface, while the other two will be cross braces installed between the pairs of legs. 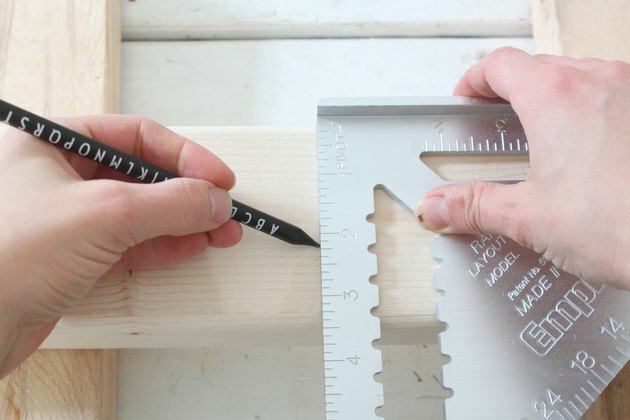 Use a square to mark cut lines. 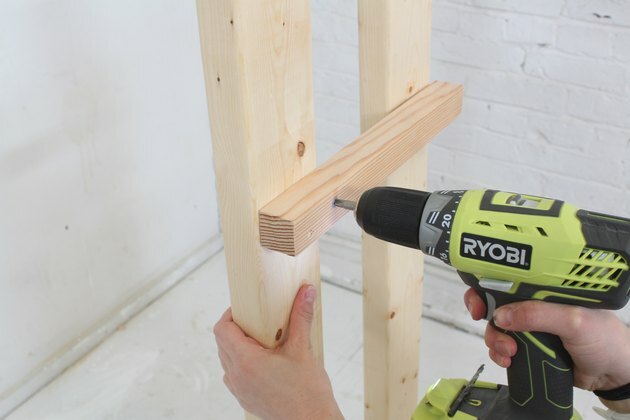 Use a circular saw to cut the balusters to length. Repeat steps 6, 7, and 8 until you have six pieces at 12 1/2 inches in length. 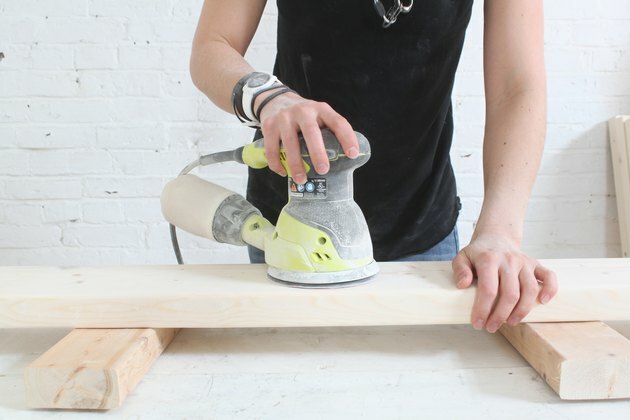 While sanding, pay special attention to the exposed ends of the boards. Sand the baluster pieces with an orbital sander. Be sure to hold or clamp the pieces tightly. They are so small and light that they will move around a lot with the sander if not held properly. 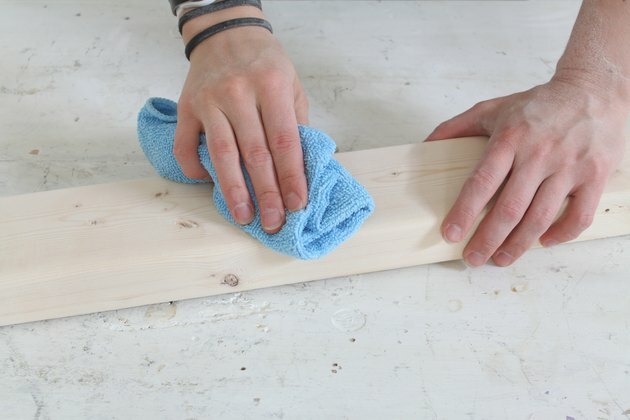 Use a dusting cloth to remove all sawdust from every piece of wood. 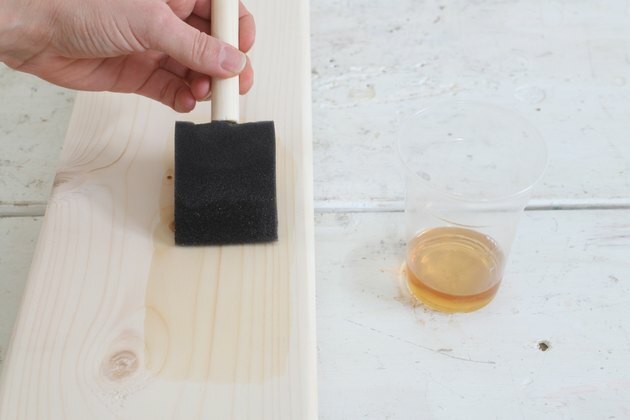 Apply one coat of Danish oil using a brush or clean cloth. Pay special attention to the ends of the boards. 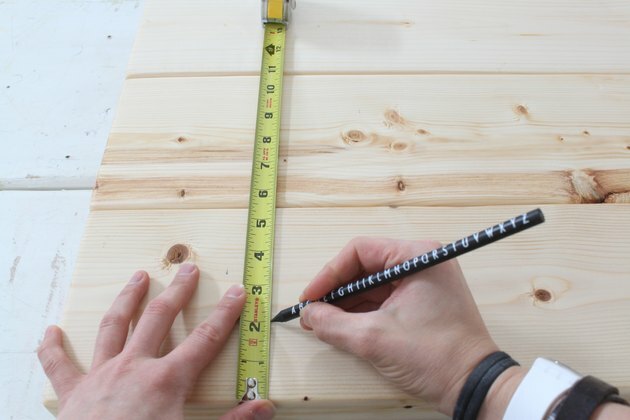 Lay the 2 x 6s on your work surface. Line them up so all the ends are matching and keep them as close together as possible. 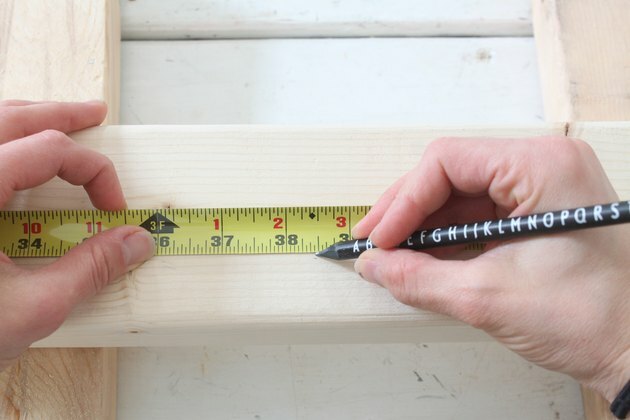 Make a mark at 4 inches in from the end. This will be the depth of the overhang. 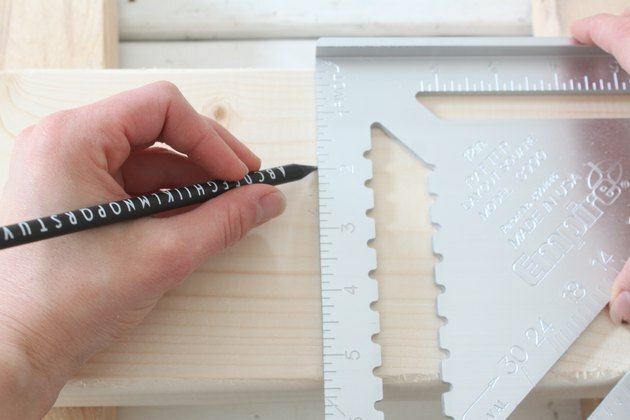 Use a square to draw a line at the 4-inch mark. Make another mark at 2 inches in from the side. 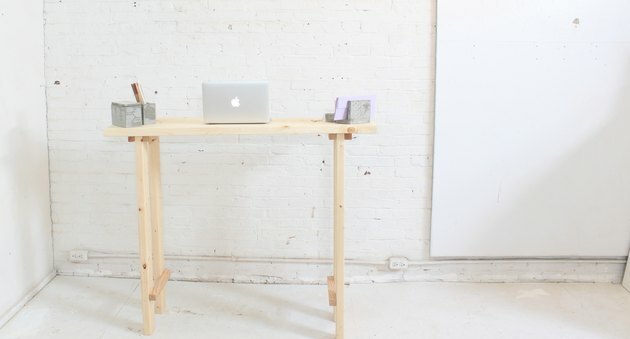 Use a square to draw a line at the 2-inch mark that parallels the side of the desktop. This will mark the end of the cleats you will install on the bottom of the desktop. Line up the first baluster piece with the lines from steps 16 and 17. Make sure it's square and exactly parallel to the end of the table. This cleat should span all three of the 2 x 6s. 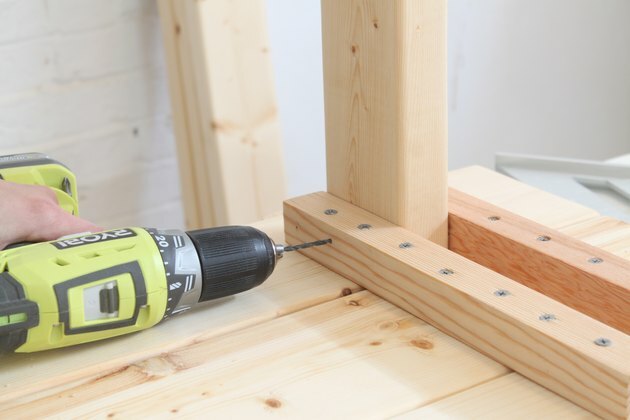 Use your power drill to drill two pilot holes on one end of the cleat. The pilot holes will prevent the screws from splitting the cleat when driven. 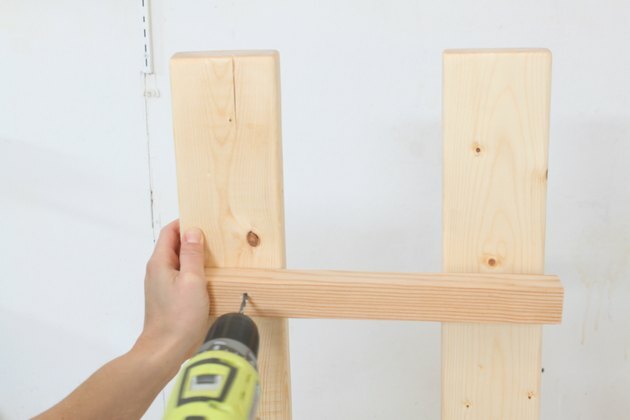 Use 1 1/4 inch screws to attach the baluster to the 2 x 6. 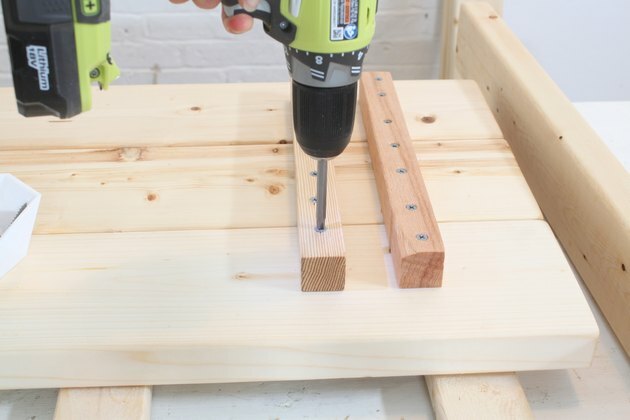 Drill the holes in a pattern of 2, 3, 2 (see photo in step 22). 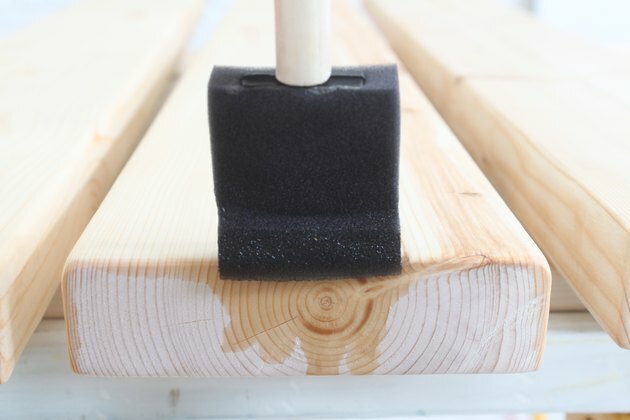 Remember to pull the boards as tightly together as possible while attaching the cleat. This will help to eliminate gaps in your desktop. 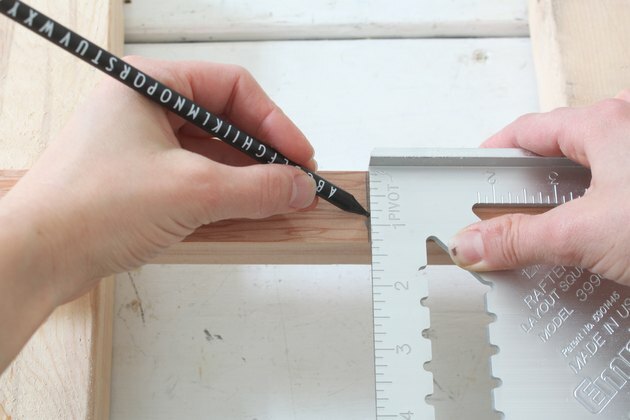 Use a scrap piece of 2 x 4 as a temporary spacer to set the distance between the outside and inside cleat. Drill pilot holes on the inside cleat in the same 2, 3, 2 pattern. These pairs of cleats will secure the vertical legs of your desk. 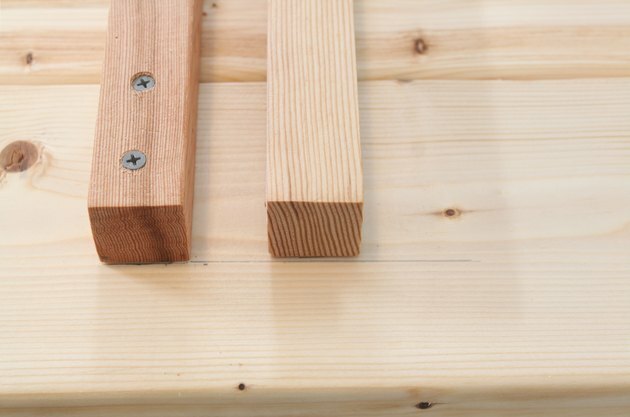 Make sure that the scrap 2 x 4 is squeezed as tightly as possible between the cleats. Screw down the inside cleat. Repeat this process on the opposite side. Remove the spacer blocks from between the pairs of cleats. 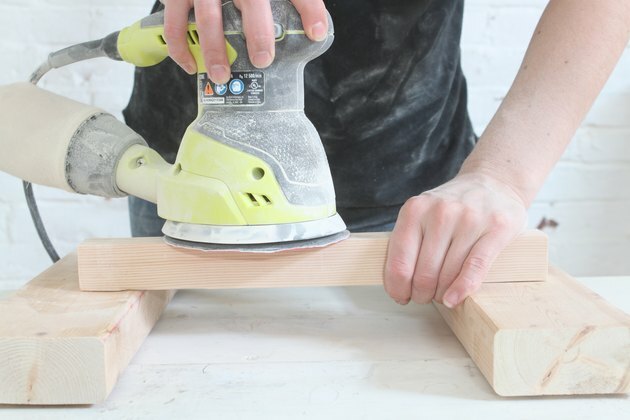 Set one of the 2 x 4 legs upright into the groove between the cleats; make sure the leg is perfectly perpendicular to the tabletop, using your square to assure a right angle. Drill pilot holes through the side of the cleat into the leg. 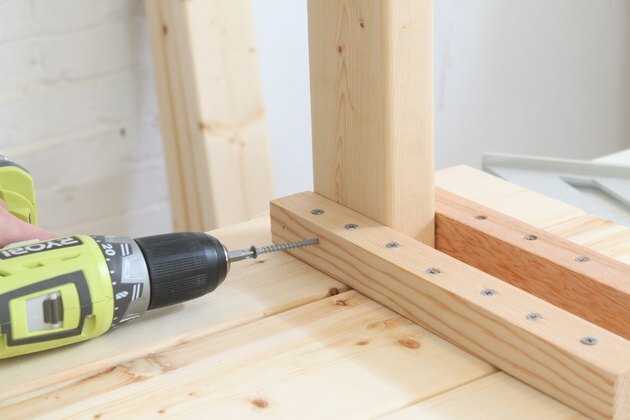 Double check to make sure that you aren't drilling into the screws on the opposite side. 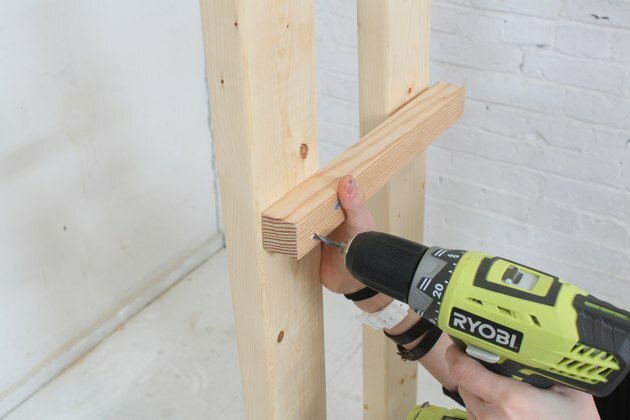 Use the 2 1/2 inch screws to attach the legs; two screws from the inside out and one screw from the outside in. Repeat this process for the remaining three legs. Make sure each leg is perfectly perpendicular to the tabletop. 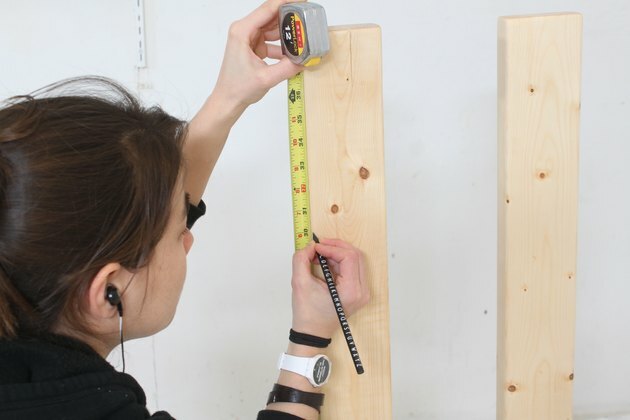 Measure 30 inches from the desktop and make a mark on each leg. These marks indicate where the cross braces will go. 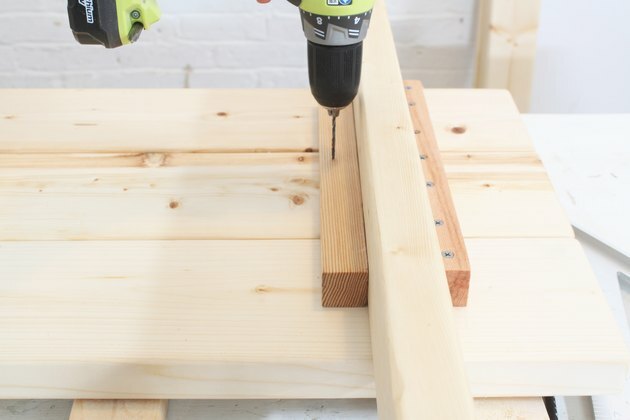 Align a cross brace with these marks and drill the first pilot hole. Use a 1 1/4 screw to attach the cross brace to the leg. Now that the brace is held in place, it will be much easier to keep it on its marks while drilling the next three pilot holes and driving screws to attach the braces. And... you're finished! Flip that desk and get partying! Or working. Or whatever.